Customer reviews are one of the most powerful marketing tools at a business’s disposal. Nearly 95% of shoppers read online reviews before making a purchase, so if you aren’t actively monitoring and responding to online reviews, you are almost certainly losing business to your competitors. You might think that bad reviews are out of your control and the only way you can stop them is to make better products and services, but this isn’t true. Customers aren’t just looking for five star reviews. They are also interested in how a company responds when things go wrong. Savvy consumers don’t expect everything to be perfect all the time, but they do expect a satisfactory resolution when there is a problem. A brand’s publicly visible response to a negative review can be just as powerful as a positive review. The main problem for brands that decide to monitor their online reviews is finding them. Google, Amazon and Facebook are the big review platforms, but there are also many specialist review sites such as Which? and Trustpilot, as well as specific industry review sites like TripAdvisor and Yelp. It’s also common to see reviews or complaints posted on Twitter and other social platforms for everyone to see. So how can a business hope to keep tabs on online reviews? A monitoring tool like Sether can do the hard work for you. First, set up your Sether account here. All you need to do is set a username and password and you’re ready to go. Log in, then hit the red “add new campaign” button at the top of the page, select “monitoring”, then “review monitoring”. Give your review monitoring campaign a title, such as your brand name, then enter a date range for how long you want to monitor reviews and hit the next button. Then you need to enter the keywords that the platform will use to find your customer reviews. Here, you don’t need to think too hard about the keywords you select. The keywords should cover your business name, brand names and any product names or services that you want to find. If your business is based on locations, such as hotel chains or restaurants, then you’ll want to enter the name of those locations, as well as any abbreviated names. For example, an employee at Coca-Cola Company might enter “Coca-Cola”, “Coke”, “Diet Coke”, “Coke Zero”, “Coca-Cola Light”, and so on. If you work for Hilton hotels, you would enter “Hilton”, as well as it’s sub brands “Conrad”, “Canopy”, “Doubletree”, “Hilton Garden Inn”, and so on. Or, you might only want to see reviews for a particular location, so in that case you might only enter “Hampton by Hilton London Waterloo”, “Hampton London Waterloo”, “Hampton Waterloo”, “Hilton London Waterloo”, Hilton Waterloo”. 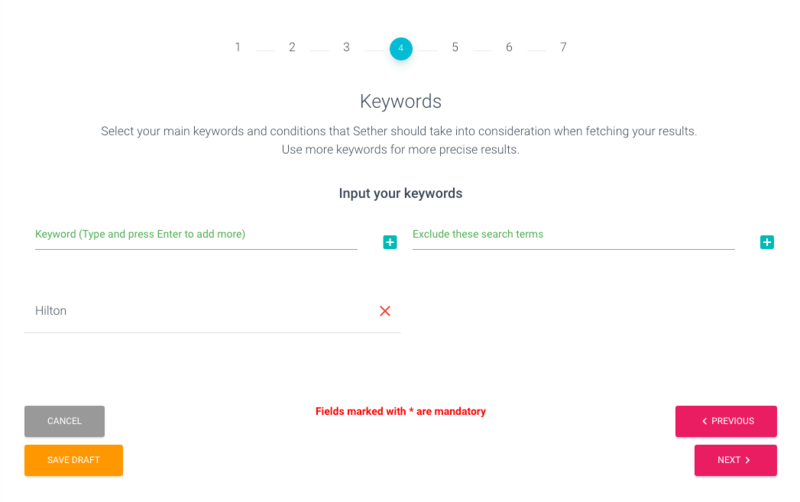 You can use the next and previous buttons to go back and forth to modify your keywords and ensure you are capturing as many reviews as possible. Press return after entering each keyword, then when you’re done hit the next button. On the next screen you’ll need to enter a country and choose a language. Hit next again and your search will start. If you want to reply, click on the “reply to this” button and you’ll be taken to the platform where the review was left. This review was on TripAdvisor, so you would need access privileges for the hotel in question to leave your comment. When you’ve finished reading the reviews and posting replies, hit next to set up your alerts. This allows you to be notified when new reviews are left that match your keywords. You can set a number so that you can monitor reviews in batches rather than every time a review is left. Most customers never leave an online review, while others only leave a review when something goes wrong and they are unhappy with how their complaint was resolved ¬– so how do you get people to leave positive reviews? The best way to get reviews is to ask. It should be integrated into your customer journey. Prompting your customers when they have finished using your services or sending an email a few weeks after they have bought one of your products is a great way to boost reviews. You can also ask your followers on social media channels questions about specific products or your business as a whole. Running a customer survey every so often is another good tactic. Giving discounts in exchange for reviews isn’t a good idea as it can be seen as buying positive reviews from your customers. An alternative is to run a competition where those leaving feedback, whether it’s positive or negative, are entered into a prize draw. Customers are more willing to write a review if it’s easy, so either direct them to Google reviews (where almost everyone has an existing account) or add a simple star rating feature to your own e-commerce platform or website. If you have a customer services department, chances are that they receive positive feedback as well as complaints. A resolved problem can also become a valuable review. Get your customer services team to suggest to happy customers that they leave an online review. You could also get permission from them to use their name in your marketing material or use their feedback anonymously. Good review shouldn’t just be left on review sites. Put them in your marketing material and feature them on your website. Don’t be tempted to hide them away in a corner or at the bottom of the page, reviews are extremely important to customers, so make sure they are front and center. If you want proof, set up an A/B test on your website, one version with prominent reviews and the other without. Bad review should be seen as an opportunity. A customer has highlighted a problem with your company and you have a chance to fix it and prevent it happening again. If they had not told you about the problem, you might not have discover it and continued upsetting countless customers. Resolve the issue with the customer with a refund or a replacement, but also ensure that you take steps to fix the issue – and include what you intend to do in your public response to the reviewer. Then, everyone can see that you actually care about your customers. It’s also wise to collate your negative reviews and see whether there are common complaints or if your customers are repeatedly asking for something that you aren’t providing. Also, if you have a policy of moving social media users who post negative reviews to a private discussion, be sure to update the post with details of how the complaint was resolved. It always looks bad when a public complaint doesn’t have a public resolution. To get started, set up your free Sether account now and start monitoring your customer reviews.